Dozens of journalists, filmmakers and photographers have come to the city in China's southeast Guangxi province to document an event that lies at the center of a battle between deeply-ingrained tradition and the encroachment of the modern world. Activists say dogs are part of the daily diet here, with an estimated 10,000 dogs killed for the festival alone. Ask a local when the tradition of eating dog meat began and you'll likely be met with a dumbfounded expression -- it is akin to asking someone when people started eating beef. For many in the city, eating dog meat is a hard habit to break, despite changing attitudes about the treatment of animals in China. Another man at the market criticizes the media attention for increasing the price of dog meat, which has doubled since 2011 and now goes for $6 a kilogram. In one stall, a butcher places a gutted and skinned dog on a wired sheath and uses a blow torch to cook a delicacy known to locals as "crispy skin dog meat." As the shop owner butchers a another piece of dog, flecks of flesh flick onto her face. She tells CNN she's been in the trade for over 10 years. "This is our tradition and we are used to eating dog. It's our culture and we won't change ... It's tasty! But we won't kill our pet," she says, referring to her own dog who is cowering in the other side of the shop. Her dog tucks his head under a freezer, shielding his eyes from the carcasses of the dogs and cats hanging from hooks. Signs around the market adorned with pictures of labradors and golden retrievers advertise raw dog meat for sale, despite new government regulations that restrict this practice. "I feel like we've had a lot of improvement in public awareness. The first time we came here in 2011 all you could hear were dogs wailing as soon as you entered into the city," Du says, as she picks off ticks from the scruff of a black dog she rescued that morning. "The biggest change is that the word dog on street signs have to be covered. This means the government has become aware that this needs to be canceled. Many people also realize that eating dog is not an honorable thing," adds Du. Du is one of over 20 volunteers who have descended upon the city from the far reaches of China, to boycott the festival. Many run dog and cat shelters in their hometowns and have spent their life savings to rescue abandoned and diseased animals. But canceling the annual Yulin festival is now their main objective. Another activist, Zhao Yangsu, said this is her first year protesting against the Yulin dog meat festival. The soft spoken 59-year old, who came to the city from Chongqing, says she's spent her retirement money, roughly $1,000, to save dogs -- a fact she's reluctant to share with her children. She and another volunteer operate from makeshift shelter on the corner of a street in Yulin, only a block from where live dogs are traded on a daily basis. Though she has come here to fight for the rights of these animals, she's pessimistic about any meaningful change here. This is our tradition and we are used to eating dog. It's our culture and we won't change. "I have no hope that these people will change and our ability to make change is not significant enough," Zhao says. "We have to go through the government to create some laws to protect these animals, but there are no laws and our ability to do anything is insignificant." Yang Yuhua, a 64-year-old retired steel worker, has also spent her life savings protecting street dogs and cats in Chongqing, and now she says she doesn't even have money to charge her phone. Yang was cradling a dead puppy when CNN arrived at the makeshift shelter. She says the puppy was born after they had rescued a pregnant dog and this one did not make it. Almost all the dogs appeared injured, disfigured and diseased. "What we need the most now is medicine, but it's the most expensive thing," Yang says as as she tears up. Many of the dogs in her care are in desperate need of antibiotics to fight off infection, but the volunteers don't know where to find them in the city. 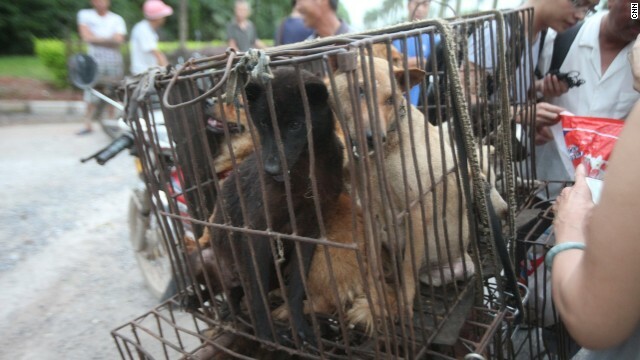 Together, the activists say they've saved more than 400 dogs this year alone in Yulin -- yet this number will be dwarfed by the number of animals likely to be slaughtered for food at the festival. Asked what makes this different from eating beef or pork, Du Yunfeng's answer is unequivocal. "You cannot categorically say that all animals should either be eaten or not eaten," she says. "So eating these animals compared to eating pork and lamb are two different things. Their value is not the same."